Heaps Decent is an Aussie based dynamic arts organisation that strives to nurture the creativity of underprivileged youths and emerging artists. By providing the equipment these musicians need, Heaps Decent works to harbour the progression of high quality Australian music. Founded in 2007 by Australian DJs Andrew Levins and Nina Agzarian with American DJ/producer Diplo, Heaps Decent has spent the last two years hosting music workshops in youth centres across Sydney and regional NSW. A partnership with Diplo’s Mad Decent label lead to workshop collaborations with established international musicians including M.I.A., Spank Rock and Radioclit. 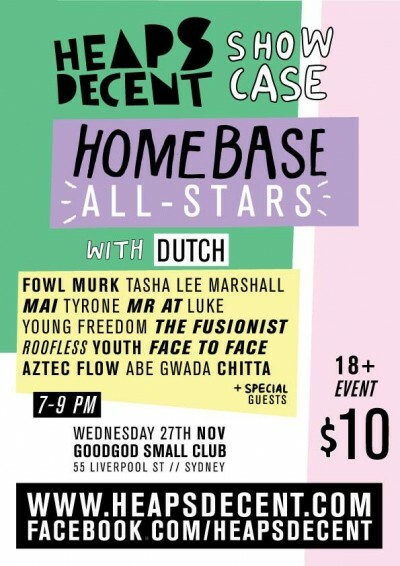 So Heaps Decent are throwing their annual showcase here at Goodgod’s very own Danceteria! Why not come down and support a totally decent cause.